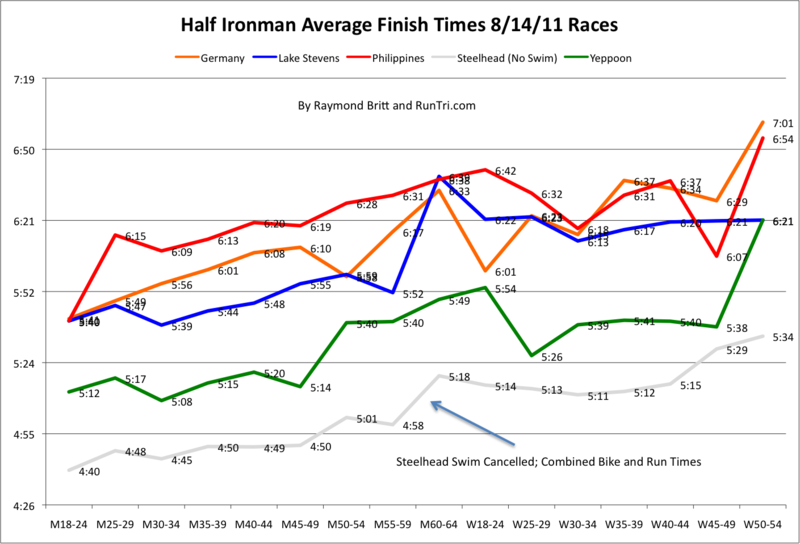 On August 18, 2011, five half ironman events took place around the world, in Germany, the Philippines, Yeppoon, Michigan and Washington State. A combined total of nearly 5,400 triathletes finished these triathlons, perhaps the largest number of half ironman finishers in a single day. An additional 192 triathletes had begun their respective half ironmans but did not finish, a 3% DNF rate. Notably, nearly 6,700 had initially registered to compete, but 17% never made it to the starting line. Lake Stevens' DNS rate of 34% is the largest we've ever seen. The Europeans are driven to compete; it appears that only 2% of registered entrants chose to skip Germany's half ironman, the lowest we've ever seen. 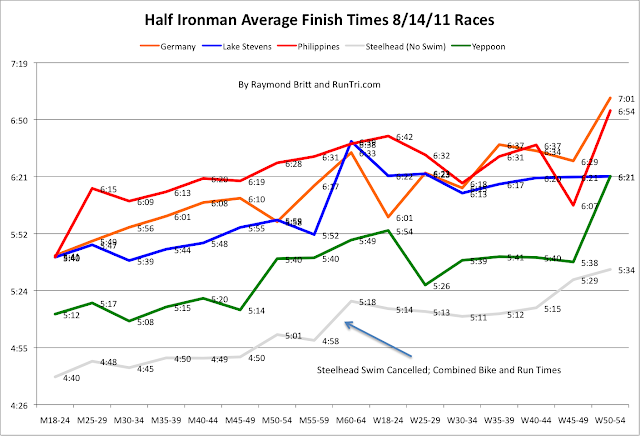 Of the five events, the Philippines half ironman appears to be the toughest challenge, as indicated by average finish times by age group. Germany comes in a close second, followed by the race in Lake Stevens. Yeppoon's inaugural half ironman featured remarkably fast finish times across all age groups. The Steelhard half ironman swim was cancelled due to weather conditions; it was transitioned to a bike/run duathlon. Interestingly, the Steelhead duathlon times approach Yeppoon's full half ironman times in several age groups.